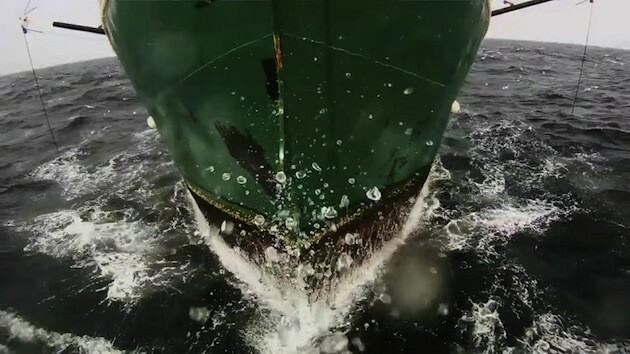 When introducing Leviathan, a sensuous, visually enthralling experimental documentary from directors Lucien Castaing-Taylor and Véréna Paravel, Chicago International Film Festival programmer Alex Kopecky made two pithy statements about the film: 1) "The film is awesome," and 2) "There are no refunds." Nervous laughter filled the screening I attended, but I considered his disclaimer justified. Though presented by the festival as a documentary—which I suppose it is, nominally—Leviathan is as far removed from the PBS-level social awareness films that most audiences associate with the documentary form as possible. Set aboard a fishing vessel and depicting the exploits of a group of fisherman, Leviathan is an impressionistic collage of color, sound, movement, and texture, painting a vivid picture of physical labor and its relationship to the audacity of nature. Decidedly nonnarrative, its structure revolves around the contrasting imagery provided by a dozen GoPro digital cameras, which Castaing-Taylor and Paravel, when not manning the cameras themselves, placed in a number of positions: Some were attached to the helmets of the seamen aboard the ship, while others were placed in waterproof containers and tossed overboard. What results is a film that's exhilarating and terrifying for the exact same reason. Images plunge from the depths of the ocean to the chaotic deck of the ship seamlessly, capturing all walks of activity, including the workers' ritualistic gutting of the captured fish as well as the swarms of seagulls hovering over the water, picking at the bloody remains. Without a firm narrative to stand on, viewers are subjected to a world they don't readily understand and therefore must rely on their senses of sight and sound. The alternating colors, textures, and noises of the images suggest a Stan Brakhage/Joris Ivens dramaturgy and are indeed the "text" of the film, while the novelistic traits of so many other films—in the festival, or otherwise—that have conditioned audiences into expecting a certain amount of information to be parlayed for their convenience are all but absent. It's easy to see, then, why Kopecky thought it necessary to remind us that no refunds would be given. As fate would have it, more than a few people at my screening wound up abandoning ship before the film was finished. With Leviathan, Castaing-Taylor and Paravel have created a truly free-form experience, one that eschews audience expectations in favor of a challenging sensory undertaking unlike anything you're likely to see in a movie theater this year. When not behind the camera, Castaing-Taylor is a Harvard professor who directs the Sensory Ethnography Lab, which "supports innovative combinations of aesthetics and ethnography that deploy original media practices to explore the bodily praxis and affective fabric of human and animal existence, and the aesthetics and ontology of the natural world." Intrigued? Leviathan screens once more this Saturday, 10/20, at 6:30 PM.